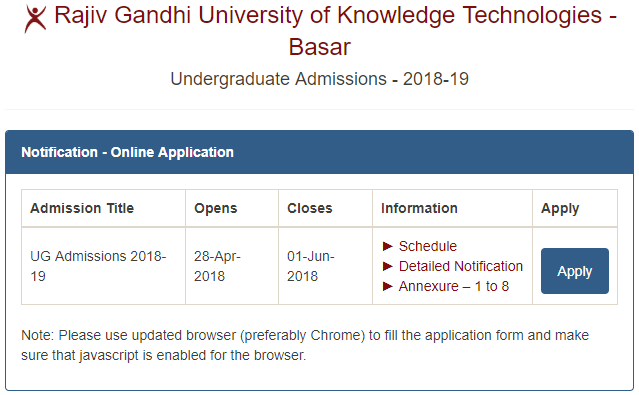 IIIT Basara Admissions 2019-20: Rajiv Gandhi University of Knowledge Technologies has released 6 Year Integrated B.Tech Programme admissions notification 2019-20. Eligible candidates can apply online from —-. Last date for receiving online application by RGUKT –, 2019. Note: *Dates are subjected to change without much advance intimation. b) Candidates should not have completed 18 years of age as on —, (21 years in case of students belonging to SC and ST categories). a) Admissions to the first year of Integrated B Tech Program (2019-20) will be based on merit in the Grade Point Average (GPA) and Grade obtained in each subject in 10th class, and by following the statutory reservations of the State. A deprivation score of 0.4 prescribed by the Government for the year 2018-19 under Statute 13 (3) shall be added to the 10th class GPA of those applicants who studied in non-residential Government Schools including the Zilla Parishad and Municipal Schools, with an objective of providing weight age to the socio economically challenged students in the admission process. MY NAME IS NIKHIL SAMUDRALA.. I HAVE A HOPE THAT I WILLKL GET ABOVE 9.8 IN SSC ..
MY CASTE BELONGS TO BC-B..
WHAT IS THE LINK TO APPLY FOR IT..
Good evening sir. My name is jetty. Deekshitha.D/o jetty .Gajanand. I belongs to SC caste.I hope I'll get 10 GPA in SSC. Can I get seat in 6years course. So plz help me. Kindly reply to my question. Thank you. Intermidiate addmission date complete information i want sir my name is anirudh from hanmakond.i got grate result at ssc so iam join basara.kindly please request when date of intermediate . I done with my 10th exams. I am expecting good excellent CGPA. I want to join IIIT Basara in 6 year integrated program starting 2019. Please let me know the complete procedure. I am shravan kumar. I done with my 10th exams. I am expecting good excellent CGPA. I want to join IIIT Basara in 6 year integrated program starting 2019. Please let me know the complete procedure. Appreciate your response. Regards. I studied in a private institution.I am sure that I will get more than 9.5 GPA in SSC.am I eligible?? I'm much interested in IIT.. I HOPE I WILL GET 9.5 CAN I GET A FREE SEAT FOR 6 YEARS COURSE . I BELONG TO BC-B CASTE AND I AM STUDYING IN THE PRIVATE INSTITUTION. PLEASE PROVIDE INFORMATION TO MY QUESTION.